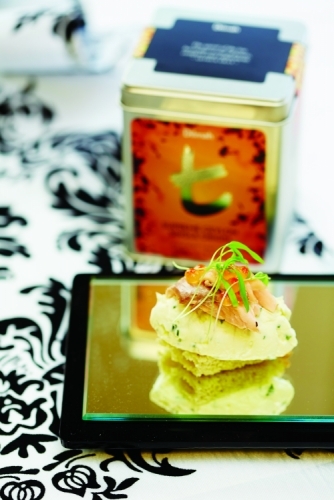 Place Dilmah Supreme Ceylon tea in the bottom of a foiled tray and then place the trout on a wire rack above it. Place the tray over a flame on a low heat. When it starts to smoke place a lid over the top and then place in the oven at 160C for 10 – 15 minutes. Sift 4 cups flour, 2 teaspoons bicarbonate of soda and 1 teaspoon salt into a large bowl. Rub in 60g butter, cubed. Mix in 2-2 ¼ cups buttermilk to form dough. Bring together on a floured surface to form a ball. Shape dough into a 20cm round. Place on the tray. Cut a cross in the top. Bake for 35-45 minutes. Cut the bread and top with crème fraiche. Flake the trout on top of the bread. Place some salmon pearls on top with picked baby chervil.